Day 19 and Briar Rose is anxiously awaiting for the hatch of her first little ones. One egg was pipped this morning before I left for work. I returned at Noon to two pips and the sounds of cheeps. And also to Ashley sitting on them because she is still trying to borrow Briar’s nest. So we removed Ashley and gave Briar back her babies… and then put four eggs under Ashley. I’ll talk about that later. By 4:15 pm … still oy two pips, but they are bigger holes now and this one is almost free. There will be at least one baby by bedtime, I’m sure. Good luck, Briar Rose and Babies! 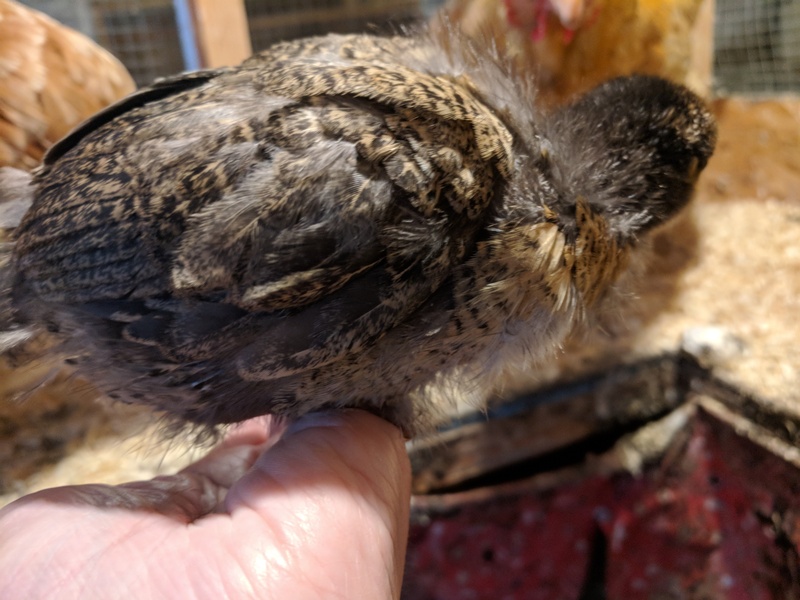 The Broody Bug has bitten my flock – big time! First, there was Pavelle, who went back in March, but thanks to the cold and snow, I was able to convince her that it wasn’t time for babies. Then, she went broody again, and as we all know now, has three week old babies. 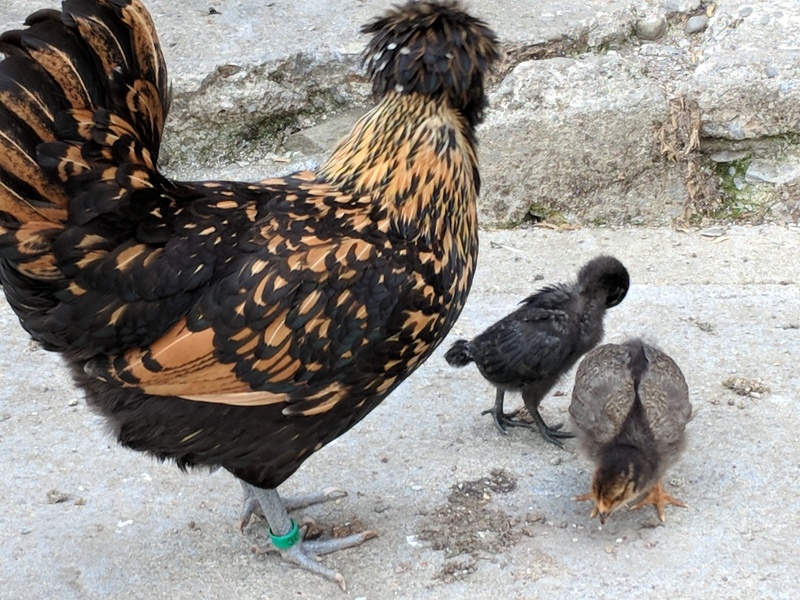 The week Pavelle’s babies hatched, one of my Australorps went broody. All the way broody. 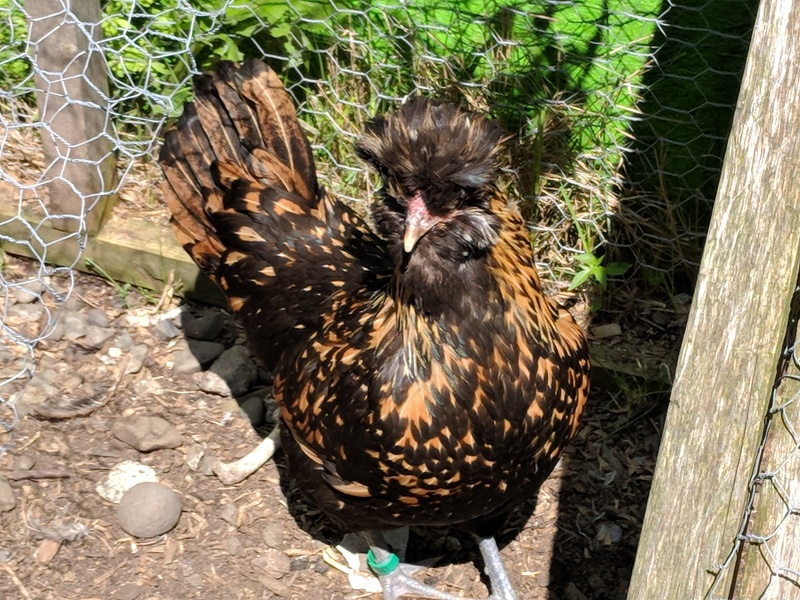 Briar Rose, a two year old Australorp who has never been broody before. I gave Briar six eggs. When I candled them the first week, all six were developing nicely. Sadly, half way through the second week, one of the eggs was broken in a next squabble. Five eggs remain, and they are due to hatch this Sunday. Briar has been a good broody in the same tradition of Abby and the Buff Orps. She has barely left the next for anything since she started this adventure. She also tolerates me petting her (with screeches but no biting) and allows me to lift her up to count eggs and remove ones she has stolen from other nests. I’m looking forward to seeing how she does with her babies this weekend. 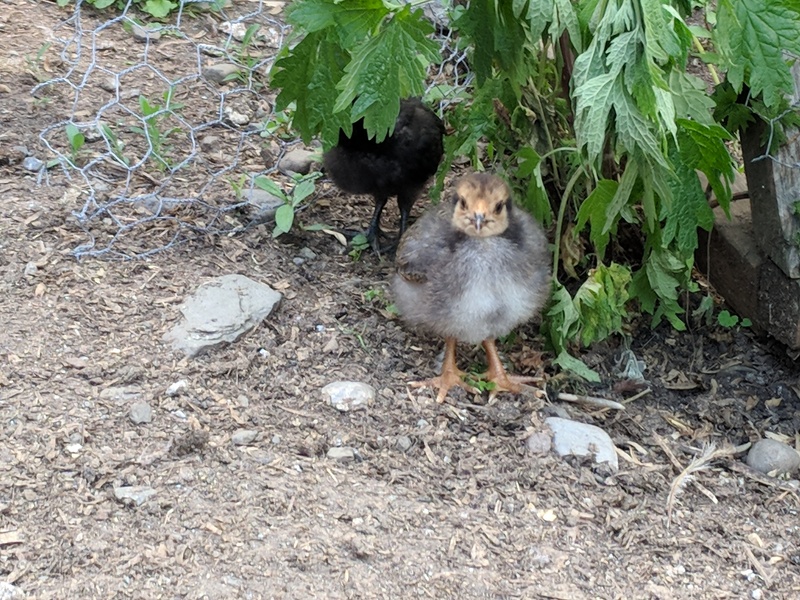 And while Briar was sitting in her babies, another Australorp went broody. We all remember Ashley, don’t we? Ashley, who was a decent enough broody, but a questionable momma last time. Ashley went hard and fast last week while I was working a full time week and no one was watching what she was doing. After the last time, I had decided that it might not be a good idea to give her eggs again, lest she lose those chicks like she did Maxie and her siblings. Last year when she went broody, I was able to put in the dog crate and break her. This time? She wasn’t caught in time and she’s so deep in it could take a long while to break. Also, she’s been pushing Briar off her nest in an attempt to have those babies. I have to remove her twice a day, leading to me wonder which hen will be on the nest when the first baby hatches. I’ve been debating just giving her a handful of eggs and getting it over with, because maybe she’s matured in the last two years? Amy, a three year old Rhode Island Red who has never been broody before. Amy is one of the RiRs who go through the motions every spring but never follow through. She’s done it two years in a row but never actually falls broody. She spent most of mid-April walking around in “thinking about it” mode and then stopped. I assumed that was the end of it. Yesterday, I found her in a box, puffed up and bucky. I guess with Briar and Ashley acting like it’s fun, she went and jumped off the deep end. 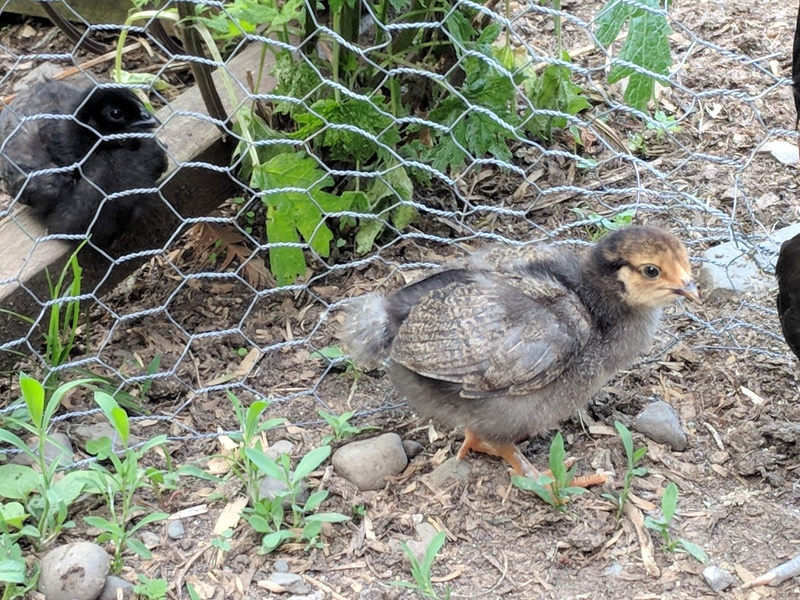 So now I have two extra Broodies. I need to come to a decision about Ashley soon, and now Amy as well. Do I give them both eggs? Or let Ashley chill out in the dog crate for a while? Can I trust her again after last time? Decisions, decisions. On Thursday, Pavelle’s two little chicks will be three weeks old. Last week, she moved them out of the cat carrier nursery where they hatched and into the nests. 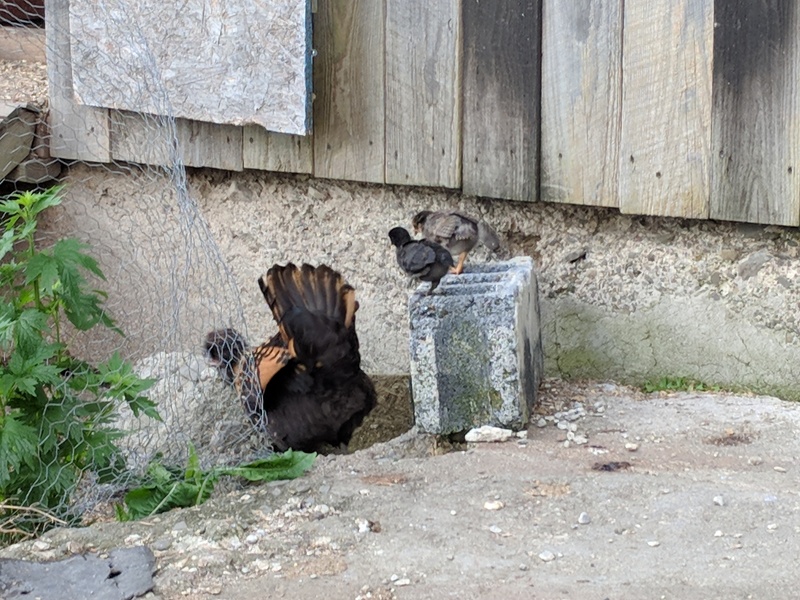 I know, I know, we’re not supposed to encourage our chickens to sleep in the nests, but YOU explain that to a broody momma with babies to protect. Especially my little attack pineapple. Seriously, it’s much better to just let Pavelle handle her babies in her own way and clean up after them than it is to try and impose my will on her. Other things to note… I was quite wrong about them not having feathered legs. The bigger of the two, who came from an olive EE-cross egg does, in fact, have feathered legs. 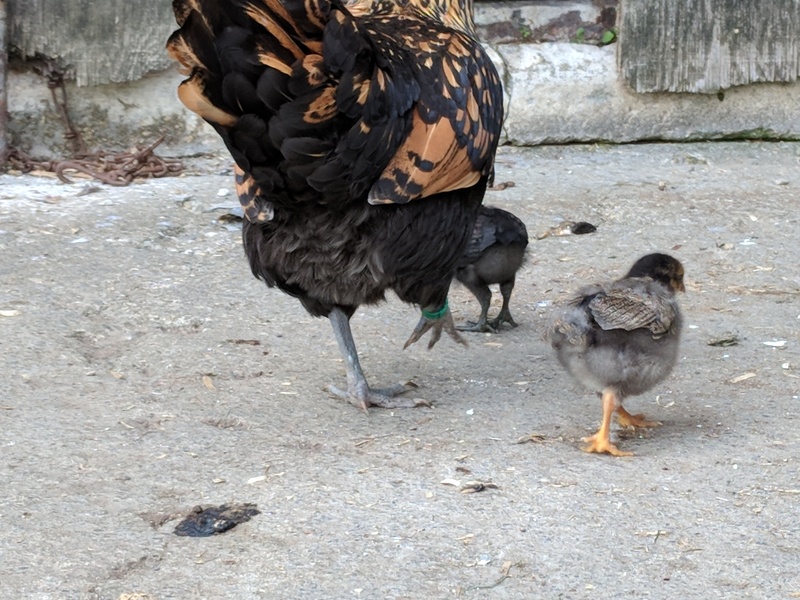 Given the overall size of the chick and yellow coloring, I am guessing Sylvester the Buff Brahma to be the father. They go outside almost every day now. Almost because we’ve had very up and down weather, and on the cooler, rainier days, Pavelle does not stray too far from the coop. Here are some pictures of them from around the 1 1/2 – 2 week mark. 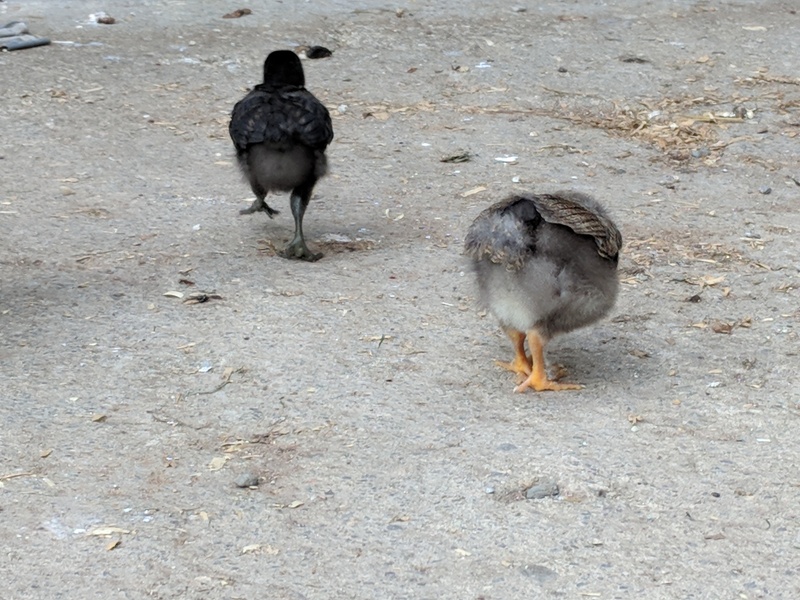 If you look closely at the bigger, non-black chick’s legs, you can see the feathers on the sides. And now here are some pics from over this past weekend. I am cute, aren’t I? 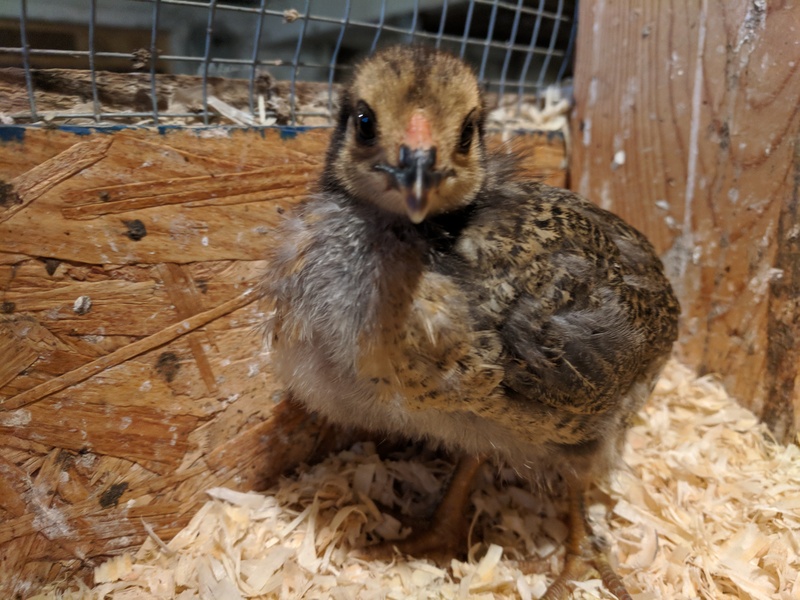 I wanted to share with you all what the “Rhode Island Eggers” in my flock look like. Again, these pullets had Rhode Island Red mommas and an Easter Egger father. This is Nutmeg. Her mother was an RiR hen. Her father was an EE rooster. She has the look of an RiR, doesn’t she? Body-wise, I mean. See? From the back, you could hardly distinguish her or her sister Cocoa from the older RiRs. But those cheeks tell a different story! She and Cocoa are curious little birds with gentle personalities. A little skittish of humans sometimes but not in the freak-out way my full EE hen Padme is. They approach me for treats held in my hand and listen when I talk to them, but dislike being held. 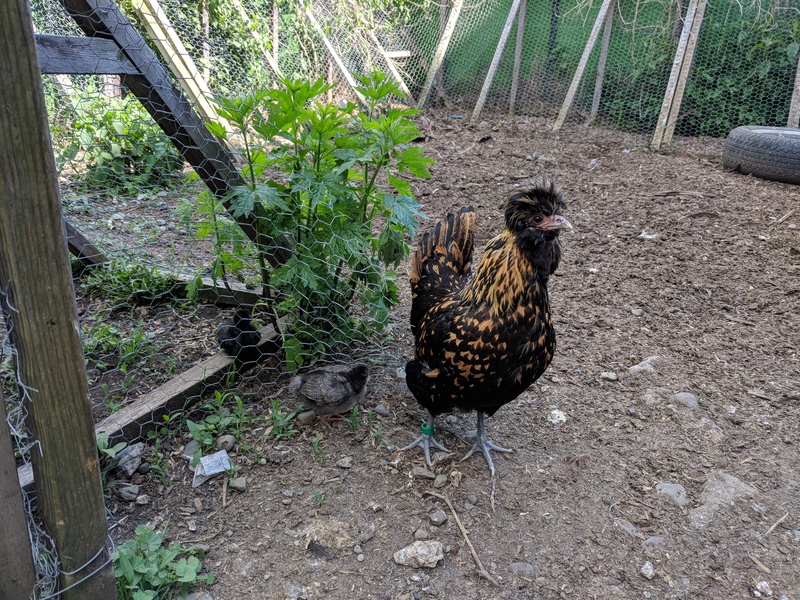 So this is my little Pavlovskya-mix hen, Pavelle. You’ll all seen pictures of her before, because she is a very unique little bird. Back in March, Pavelle went broody, but I refused to let her have eggs then because it was still too cold and snowy for little wee things. She went broody again last month, and after a few days of watching her, we decided to let her have a couple of eggs. 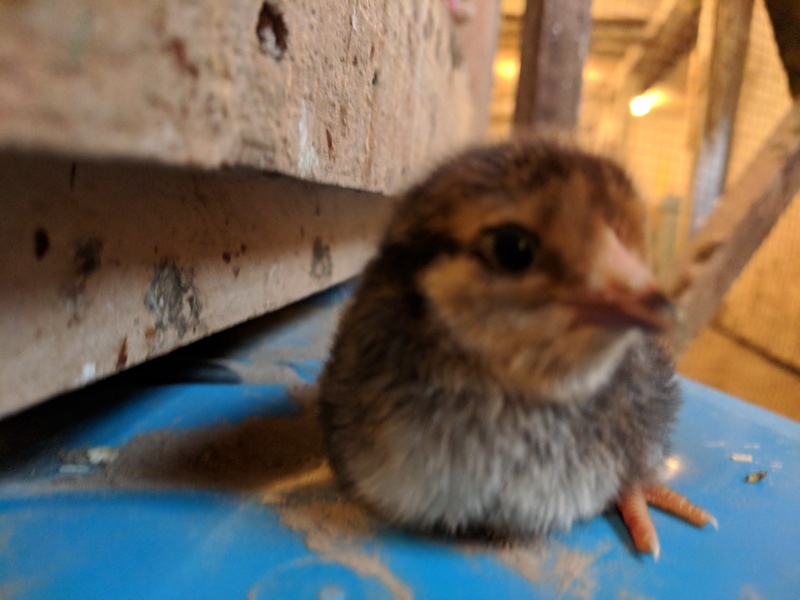 This one was the first one to hatch, a brown and yellowish chick that came from one of our olive egg layers. The olive egg layers are all the children of last year’s Easter Eggers, Padme (the hen) and Luke (the ill-fated rooster. Yes, he did father three little hens and one rooster before we sent him to freezer camp). Best guess as to which hen supplied the egg? The size of the egg suggested Iggy (the EE cross Pavelle raised last year) or Cocoa and Nutmeg. Cocoa and Nutmeg I call my “Rhode Island Eggers” because they are the color of my RiRs and have EE cheeks. I suspect their bio-moms were RiR with Luke as the father. It will be interesting to see how this little one feathers out, won’t it? And this little precious came from a small brown eggs. 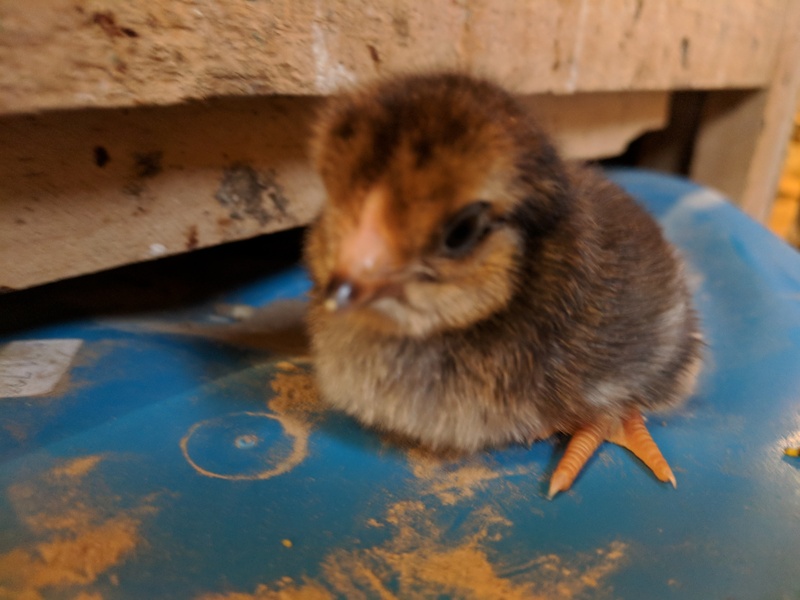 I have a lot of smaller brown eggs right now, because all of the chicks from Little Dude’s Hatching Egg project are laying now. This one, as you can see, is all-black and tiny. I have only one all-black hen, little Bella, the ‘Mad Scientist’ chick that My Pet Chicken slipped into our order. Bella, the Mad Scientist. Which is just another word for some kind of cross. My Pet Chicken couldn’t even tell me what breeds went into making her. Bella must be the bio/egg mom to the little wee black baby. As to who sired them? I have three roosters, and haven’t been around much to see who has been hanging out with whom. 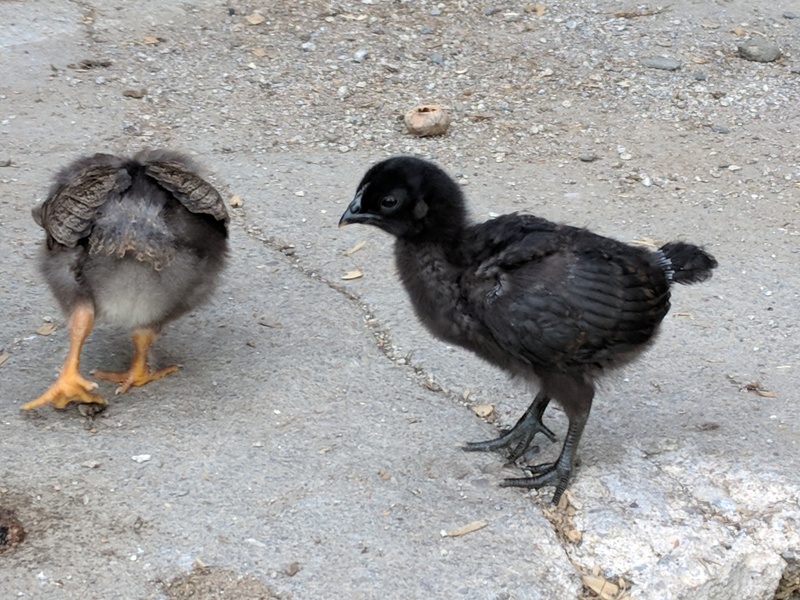 I know what Philip (my little Leapy Boy) and Sylvester both have small followings and they are mostly the younger girls. But it’s hard to tell right now. Neither of them have feathered legs, which is possible with both of those two roosters. The Australorp in this video is Briar Rose. She seems to think she is going broody right now. I guess it really is spring here on the farm… finally!